The handset maker, OnePlus, will launch OnePlus 6T during the October 30 event held in New Delhi and New York. 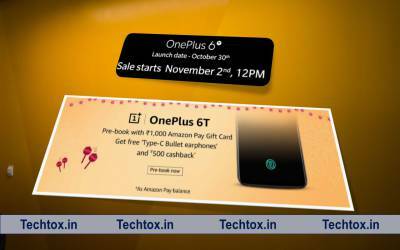 Pre-booking of OnePlus 6T on e-commerce site Amazon has started from 12 noon today. Customers interested in pre-booking for OnePlus 6T must first purchase the Amazon E-Gift Card. Gift Card can be used when buying OnePlus 6T Mobile. OnePlus on Monday revealed the date of the launch of its next flagship smartphone. The company has also revealed that the smartphone will not have a headphone jack. The phone has the convenience of USB Type-C or Wireless Bluetooth earphones, but this flagship smartphone of OnePlus will not come with the wireless charging support. OnePlus 6T Mobile pre-booking starting in India on AMAZON: For a pre-booking of OnePlus 6T, first, visit the Amazon page. Explain that during the pre-booking, you will have to pay Rs. 1,000. After this, you will be sent a gift card by email. The OnePlus 6T cell will be on Amazon 2 November at 12 noon. OnePlus says that OnePlus will be equipped with a 6T in-display fingerprint sensor. In addition to pre-booking, the company has confirmed that a battery of 3,700 MAH batteries has been given to boost the phone. Cashback of Rs 500 will be available in your Amazon Pay Account by 6th November. The coupon code will be mailed by November 15 for a purchase of OnePlus Type-C bullet earphones. Explain that the price of earphones is Rs 1,490. You do not have to pay the fee if you use the coupon code. OnePlus 6T pre-booking is being done on the Amazon Store and in the offline store of Kroma Store and OnePlus. According to the old report, OnePlus 6T will have a 6.4-inch optical Amolade Full-HD + display and Qualcomm Snapdragon 845 processor. Expect to provide storage up to 256 GB with 6 GB and 8 GB RAM. The smartphone will have a 3700 mAh battery, which is bigger than the OnePlus 6 3300 MAH battery. Also, OnePlus 6T's Out of Box is expected to run on Android 9.0.